» home » magazine » 2017 » » 3d metal printing--what's next? Recognized additive-manufacturing industry leaders like General Electric, Airbus and Rolls Royce, stalwarts of the aircraft/aerospace industry, have evolved to where they now can start to manipulate the 3D metal-printing process to enable them to repeatably build sound, quality parts. But they recognize that there is still so much to learn, and they lack the resources and knowledge base to explore some of the very basic issues that will allow them to get to the next level, and beyond. Such is the foundation of the industry-university collaborative research and development efforts that have risen in recent years, none more significant, innovative and industry-driven than the NextManufacturing Center. Born early in 2015 on the campus of Carnegie Mellon University (CMU) in Pittsburgh, PA, the NextManufacturing Center is a collaboration of faculty and students from across the college. 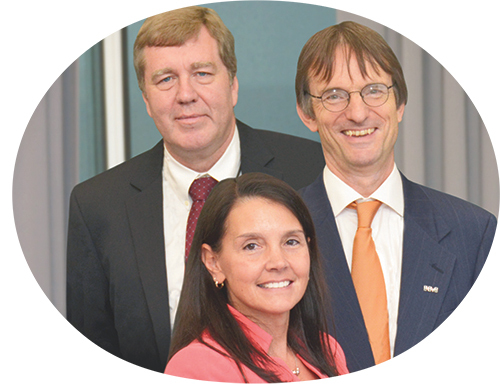 And, in July 2016 the center launched a consortium that includes a diverse portfolio of member organizations, all interested in building the future of additive manufacturing. During our recent visit to the NextManufacturing Center, we learned of its commitment to building the knowledge base needed to expand the use of additive processes throughout manufacturing. And, 3D metal printing is at its center of attention. The NextManufacturing Center 3D metal-printing roadmap includes several points of emphasis, including microstructure control and porosity modeling; machine learning and part qualification; topology optimization; and powder spreading and melt-pool geometry. The NextManufacturing Center facility is home to two Arcam S12 electron-beam metal-printing machines, an EOS M290 laser-sintering metal machine and an ExOne Innovent binder-jetting machine. Also in the lab are polymer printers (Objet and Stratasys models) and finishing equipment, including a GF Machining Solutions wire-EDM machine. Expanding the acceptable range of powder properties, while developing new alloys to take advantage of the rapid solidification rates present during 3D metal printing. 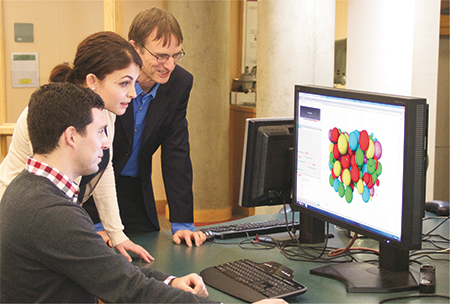 Seen here with CMU Ph.D. students Ross Cunningham and Tugce Ozturk, NextManufacturing Center associate director Tony Rollett (top) oversees research and development efforts focused on powder characterization and properties. At their disposal: a state-of-the-art computer tomography lab, where NextManufacturing Center projects have addressed, among other issues, how powder porosity transfers to parts and how to alter process maps to optimize defect population in 3D-printed metal parts. Other process-control research underway, explains NextManufacturing Center associate director Tony Rollett (a CMU professor of materials science and engineering), addresses the microstructural effects of varying melt-pool cooling rates during the electron-beam powder-bed process, because part temperature can vary during a build. Another Ph.D. student, Brian Fisher, collaborating with the University of Texas El Paso, has demonstrated that with a dependable thermal-feedback control system, build parameters can be adjusted to control the cooling rates throughout the build and maintain consistent grain size. The NextManufacturing Center team also is hard at work developing process maps to allow aerospace manufacturers, and other adopters of metal-additive manufacturing, some leeway in how they operate their machines. As explained by the center’s executive director Sandra DeVincent Wolf, the machines—laser and electron-beam—can do much more than they currently are asked to do. Two important aspects of bringing this work to life: controlling porosity during the build; and allowing manufacturers to work with a wider variety of powders—varying in particle size and shape—and still yield acceptable parts. Research efforts led by Elizabeth Holm (right), CMU professor of materials Science and engineering, are focused on automating the process of analyzing microstructural scans. Dubbed ‘computer vision,’ this technology allows researchers to quickly and accurately analyze data-laden images and organize them by specific features—much more efficiently than can humans. We saw evidence of this development work during our tour of the NextManufacturing Center, home to two Arcam S12 electron-beam metal-printing machines, an EOS M 290 laser-sintering metal machine and an ExOne Innovent binder-jetting machine. Also in the lab are polymer printers (Objet and Stratasys models) and finishing equipment, including a GF Machining Solutions wire-EDM machine. In particular, CMU mechanical-engineering Ph.D.-candidate student Zack Francis explained to us the impact of beam-spot size, power and speed on the melt pool and on part quality. Also noted: how high-speed imaging can be used to better understand what goes on during the build. It’s also important to understand and prepare for the coming increase in the types of alloys available for 3D metal printing. For the most part, explains Wolf, manufacturers are printing with the same alloys that have been developed for other processes, such as casting and thermal-spray coating. However, that soon may change, she says, thanks in part to a new project, led by CMU assistant professor of materials science and engineering Bryan Webler, to develop new powder alloys designed specifically to take advantage of the high cooling rates of additive manufacturing. The NextManufacturing Center at Carnegie Mellon University invites organizations to support its efforts to advance 3D-printing technology to enable widespread adoption and certification. Membership, at various levels, allows opportunities to guide the overall direction of research projects, invitations to attend member meeting, gain access to project progress reports and access to training programs. The star-studded list of NextManufacturing Center contacts and collaborators includes founding consortium members Alcoa (now Arconic), ANSYS Inc., Bechtel Marine Propulsion Corp. (Bettis Naval Nuclear Laboratory), Bosch, Carpenter Technology Corp., Federal Aviation Administration, General Electric Co., General Motors Co., Ingersoll Rand Inc., National Energy Technology Laboratory, SAE International and United States Steel Corp. Other center collaborators include Lockheed Martin, Oberg Industries, Eaton, Covestro, Kennametal, NIST, Sandia National Laboratories, NASA, Sciaky and Pratt & Whitney. Learn more by visiting www.engineering.cmu.edu/next. A large area of focus for the NextManufacturing Center is powder characterization and porosity, and defect analysis. Among the goals: understanding better how process variables impact part quality, and developing practical guidelines for setting limits on defect size and population so that users can then optimize their processes to work within those boundaries. Walking me through the process of part-microstructure imaging and analysis in the lab were CMU materials science and engineering Ph.D. students Ross Cunningham and Samikshya Subedi. They’re using the latest in supercomputing tools to analyze data collected at the national synchrotron-radiation light-source research facility at Argonne National Laboratory in Chicago, IL. “Part of our work here centers on powder characterization,” Cunningham explains. “We’re learning how the raw materials used impact part properties and defects. From the 3D images and models, we’re learning how powder porosity transfers to the parts, and have been able to share that knowledge with the powder suppliers. This work also supports the process-mapping projects underway at the NextManufacturing Center—looking at porosity results as the process changes. 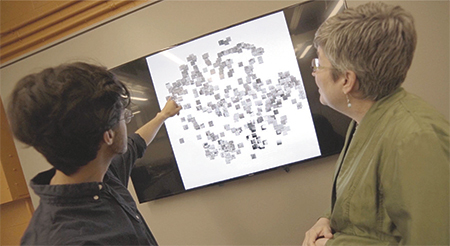 Lastly, we sat with Elizabeth Holm, CMU professor of materials Science and engineering, to discuss work she’s leading for the NextManufacturing Center on automating the process of analyzing microstructural images. Capitalizing on concepts of computer vision, which enables computers to interpret visual images, this technology allows researchers to quickly and accurately analyze data-laden images and organize them by specific features—much more efficiently than can humans. Another application, of particular interest to the Federal Aviation Administration (FAA), is the ability to use microstructure images—taken, for example, of 3D-printed metal parts—to classify the success of a build. “The FAA, Holm says, “would like to be able to scan 3D-printed structures and quickly prove-out a process based on this imagery and analysis. The industry needs to be able to efficiently classify successful build microstructures. Today this is done subjectively, by manually examining properties such as grain size and orientation. Our work in computer vision will allow this process to be automated, allowing the FAA and others to efficiently qualify builds, write specifications and establish visual tolerances. See also: Arcam AB, ExOne, Stratasys, Inc.